If Hyperloop was not enough, this concept aims to place your cars on electric sleds and speed through underground tunnels. Elon Musk just shared a glimpse of an electric sled travelling at breakneck speed down a tunnel. While the exact peak speed achieved has not been mentioned in the video, Musk has claimed that these underground electric sleds will have the prowess to travel at speeds of up to 200 kilometres per hour. These tunnel-tearing sleds will also have the ability to automatically detect route switching, and to make it easier for everyone to understand, he claims that transportation between "Westwood to LAX in 5 mins" is what is possible. The project is part of The Boring Company, that aims to dig underground tunnels to evade traffic. In what sounds overtly simple, the company has already released a concept video to show how cars can drive on to an electric sled platform, which would then descend underground on an elevator and speed through to the desired destination at high speed. All of this seems to have begun with Musk's frustration of being stuck in traffic, and a prototype of the 'simple' solution for evading traffic seems to already be here! 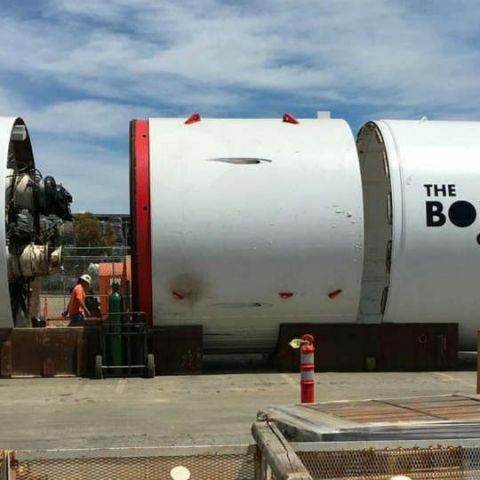 While further details are yet to be released, The Boring Company is certainly progressing fast. Part of Elon Musk's grand plans (apart from heading to Mars) includes completely changing ways of commuting that began with Tesla's all-electric capabilities and moved on to Hyperloop, the hyper-speed commuting service. Now, with this little electric sled, it becomes hard to not believe in his ability of making all of these futuristic concepts real. Let's hope it all happens soon! Is Android really creating a change or just a \"no difference\" bar? What is the definition of a database switchboard?